Fresh ground Angus beef with Bulgogi sauce, cheddar cheese, carrot pickle, baby spinach, European cucumbers, homemade slaw, and avocado on our organic whole wheat burger. Pan-fried tofu, portabella mushrooms, baby spinach, roasted bell pepper, red onion, avocado, and cucumber, all on our organic whole wheat burger with balsamic glaze and Sweet Hut sauce. A vegetarian's choice. Charbroiled lemon grass pork, carrot pickle, jalapeño, and cilantro with homemade sauce. Thin-sliced sirloin steak, portabella mushroom, grilled onion, provolone cheese, homemade mayo with Bulgogi sauce. Grilled chicken breast or steak, green onions, and pepper jack cheese with Miso-sesame mayo. 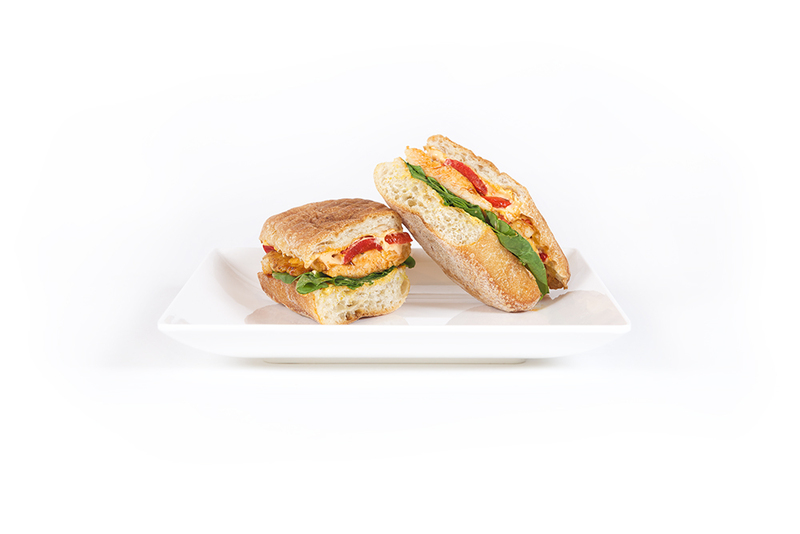 Grilled chicken breast, baby spinach, roasted red bell pepper, cilantro, and provolone cheese with chipotle mayo on our freshly baked Ciabatta. Smoked turkey, Swiss cheese, and baby spinach with artichokes pesto on our freshly baked Ciabatta. Grilled marinated chicken breast with Bulgogi sauce, baby spinach, caramelized onion, roasted red bell pepper, and pepper jack cheese with Sriracha mayo on our freshly baked Ciabatta. Grilled chicken breast, baby spinach, fresh basil, provolone cheese, olive, and artichokes with sundried tomato spread on our freshly baked Ciabatta. Fresh Angus beef made with a Bulgogi sauce, cheddar cheese, pickled carrot, baby spinach, sliced cucumbers, our homemade slaw, and avocado top our organic whole-wheat burger. A vegetarian's choice. Pan-fried tofu, portabella mushrooms, baby spinach, roasted bell pepper, sliced red onion, avocado, and sliced cucumbers top our organic whole-wheat burger with a balsamic glaze and our homemade sauce. A Bulgogi burger topped with stir-fried carrots, sesame seasoned bean sprouts and spinach, and a fried egg, drizzled with our house made sauce on our home-made whole-wheat bun. Charbroiled lemon grass pork, pickled carrots, sliced jalapeños, and cilantro with a homemade sauce served on a fresh baked Hoagie. Thinly sliced sirloin steak, grilled portabella mushrooms and onions, topped with provolone cheese, drizzled with Bulgogi sauce served on a fresh baked Hoagie spread with a light layer of our homemade mayo. Grilled chicken breast or steak topped with pepper jack cheese, green onions top a freshly baked Hoagie roll with a thinly spread layer of Miso-sesame mayo. Grilled chicken breast, baby spinach, roasted red bell pepper, cilantro, and provolone cheese on a fresh baked Ciabatta spread with chipotle mayo. 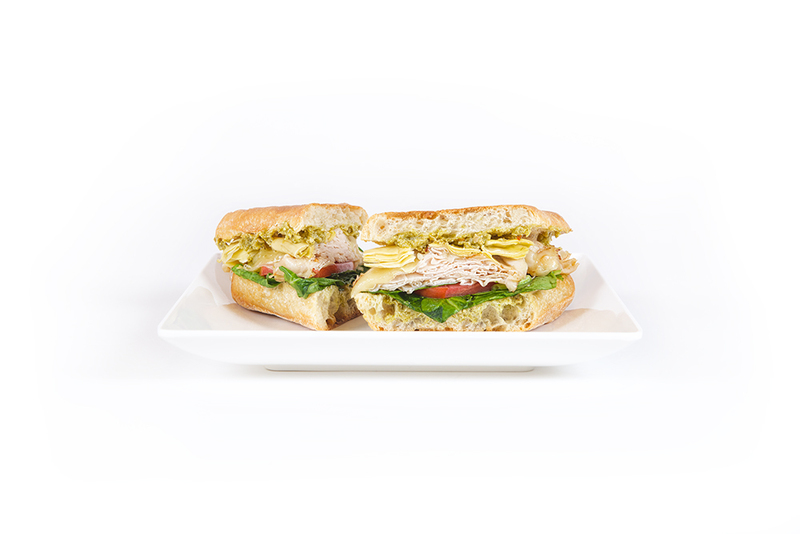 Sliced smoked turkey, Swiss cheese, and baby spinach accompany an artichokes pesto on our freshly baked Ciabatta. Grilled chicken breast marinated in a Bulgogi sauce topped with baby spinach, caramelized onions, roasted red bell pepper, and pepper jack cheese on our freshly baked Ciabatta spread with a Sriracha mayo. Portabella Mushroom, baby spinach, roasted bell pepper, sliced red onion, avocado, and sliced cucumbers, top our freshly baked Ciabatta with a balsamic glaze and our homemade sauce. Smoked turkey, Swiss cheese, spinach, sliced tomato, mayonnaise, and Dijon-mustard on our freshly baked multi-grain bread. Chicken salad, made with grilled chicken breast, red grapes, celery, dried cranberries, and roasted almonds, sit on top of spinach, and sliced tomatoes in between slices of fresh baked multi-grain bread or a croissant. Gluten-free. Chicken salad, made with grilled chicken breast, red grapes, celery, dried cranberries, and roasted almonds sit on top of lettuce. All-time favorite. Avocado, bacon, lettuce and sliced tomatoes between our multi-grain bread. Avocado, sliced tomatoes and lettuce between our multi-grain bread.